Best Use Of A Diminished Chord? Anyway, one of my favourite tunes is ‘Beatriz’ by Chico Buarque, there are some splendid diminished chords in that. 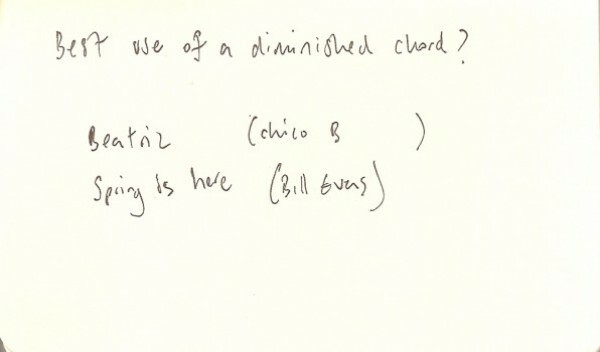 Also the intro to Bill Evans’s version of ‘Spring is Here’ is great. Obviously is not just ‘the chord’, but all of the stuff that leads to it, the context and whatnot, but you know what I mean.